Jaymie - Is it possible to add a visual cue on nodes that are collapsible? Philip, are you thinking a visual cue on nodes that could ever be collapsed (going by your proposal, that would include any node with at least one input) or on nodes that can currently be collapsed (have one input receiving data)? I was thinking a cue that would be visible only when a collapse is possible, such as in the case of having only one input and output, or having only one input or output connected to cables. Maybe the cue could be clickable to trigger the collapse without requiring a contextual menu, and maybe the cue could be crossed out or greyed out if something occurs to make it uncollapsable. Understood. We'll keep this in mind for when the feature gets voted up. The challenge is always to determine how a visual cue might be added without making the user interface too "cluttered" or "busy". Fair enough. I'm thinking something like a little corner minimize button that can just disappear when the node is not collapsable. I had a visual concept for collapsing all nodes irrespective of their functionality, inputs used or unused, outputs purely for the sake of saving screen real-estate. Especially as 'macros' (in QC speak) don't really exist in Vuo yet and even sub comps have the event-sharing-to-input-port dilemma that prevents its use in many contexts. In a way this is probably a separate FR but putting it down here for context. Happy to make new FR if asked. My idea is that you just double click on the node anywhere below the title area (which double clicking in is reserved to change the name) and it collapses then click the squished area b/w title and input and output ports (which I've shown with a little triangle icon) to expand it. 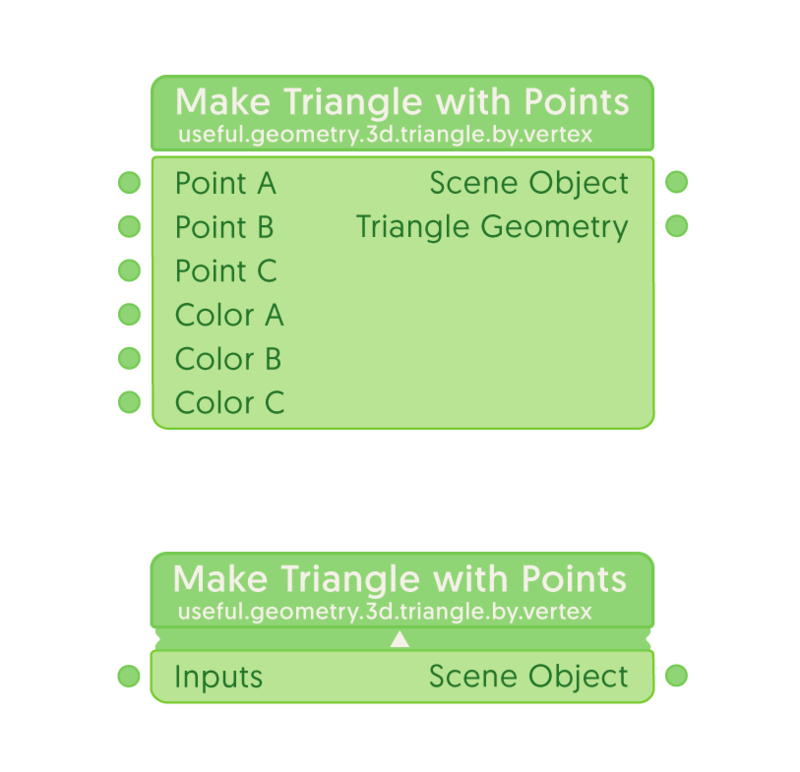 Dragging a cable over an input or output port would either instantly expand the node or bring up a port sector contextual menu, similar to the converter contextual menu when you drag a cable from a 2D point output port onto a 3D Point input port. Obviously nodes with multiple input wires would have the wires all entering the same port in collapsed appearance of node, which is fine by me. If there is only one input and/or output port being used then those port labels could be used in the collapsed appearance. Many nodes only have one output port used in most compositions so often that label would appear under this concept. The idea of the animation to expand would be the lower section goes up into the title bar and then comes down again like a blind with all the inputs and outputs in their normal place. When collapsing it would do opposite animate up to hide all ports then come back down with single input and output and all wires attached to them. Maybe even the node class descriptor could be removed to shrink it further.